IROSIN, Sorsogon—Nobody in this highly agricultural town ever wished for it to happen, but the tragic death that recently struck a family here for eating sea turtle meat was a sad scenario taking place along most of the coastal waters of Sorsogon province — the unabated slaughter of the internationally-protected marine reptile. Last Sunday, three young children aged one, three and five died and their parents hospitalized for food poisoning after partaking for lunch cooked sea turtle (pawikan) meat bought from a local vendor, according to a police report. And since this town is landlocked, suspicions were rife that the killer meat was either from its surrounding coastal towns of Bulusan, Bulan, Matnog, Sta. Magdalena, Barcelona or Gubat -- all areas sitting along the coastline of the Pacific Ocean where the trading of meat of poached and butchered pawikan is said to be rampant. The local police are investigating on this incident. In the nearby Bulusan town, a fisherman from Barangay Dancalan told the Philippine News Agency that a weekly average of one pawikan weighing 40-100 kilograms is hauled by fishermen from the municipal fishing ground either accidentally caught with their nets or hunted with home-made harpoons. “Alam ng mga ito na ipinagbabawal ng pamahalaan ang paghuli at pagkatay ng pawikan kaya patago nilang ginagawa ito, pati na ang pagbebenta ng karne nito (These people know that the government prohibits the catching and slaughtering of marine turtle that is why they do it, as well the sale of its meat, discreetly),” he said. A kilo of pawikan meat, he added, is sold to patrons for around Php250. Bulusan Mayor Nani Halum said his administration does not tolerate any act detrimental to the existence of pawikan within the town’s territorial waters. “I have made it clear among our fishermen that anybody who will be caught catching, slaughtering or vending its meat will be prosecuted according to the provisions of laws for the protection and conservation of these endangered marine species. Eating its meat is also prohibited,” he said. Under Republic Act No. 9147 or the Wildlife Conservation and Protection Act, anyone who would be found involved in the selling or trade of pawikan meat shall be imprisoned for two years and fined up to Php200,000. The same penalty applies for anyone who eats the meat of the endangered species while a stiffer penalty of four to six years of imprisonment as well as a fine of Php500,000 await the person who slaughter the pawikan. “Anyone involved will be made liable under this penal law that basically recognizes slaughtering of any of our pawikans as the same as murdering a human being,” he stressed. In the town of Barcelona, information gathered by PNA indicated that even local officials would place pre-orders to known poachers of pawikan meat that is cooked into delicacies popularly sought for, especially during fiestas and other special occasions. There is indeed a passion for turtle meat among people around areas covered by the second congressional district of Sorsogon, Sotero Gacis of the same town said. Local authorities, while not so keen on enforcing laws that intend to save these marine species from total extinction would even encourage some fishermen to catch sea turtles for its meat for them, he said. The town’s vice mayor, Nono Estopace, shrugged off the information, saying that while he is aware that Bulusan people consider pawikan meat as a delicacy, he has not gotten of an information lately that a sea turtle has been caught from local waters and slaughtered. Should there be one accidentally caught alive or entangled in fishermen’s net, Estopace said, they would be reported to local authorities, turned over to the Department of Environment and Natural Resources (DENR) for documentation and eventual release back to the sea as required by law. Early last month, a lifeless green marine turtle weighing around 100 kilos was found floating along the shoreline of Sta. Magdalena with several hack wounds and a harpoon pierced into its body. As cold-blooded creatures, pawikans have body temperatures that fluctuate with the environment and they have a pair of lungs that need to breathe every few minutes while swimming unknown distances in the vast seas. They have powerful flippers which help them navigate but cannot retract into their protective shells called carapace which sets them apart from their freshwater relatives that can easily hide their heads and legs inside their bony shells. There are seven species of marine turtles worldwide. 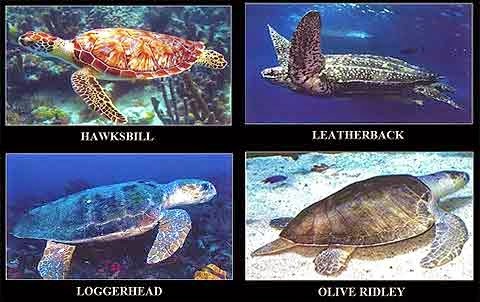 Five of these — Green (Chelonia mydas), Hawksbill (Eretmochelys imbricata), Loggerhead (Caretta caretta), Olive Ridley (Lepidochelys olivacea) and the Leatherback turtles (Dermochelys coriacea) — are found in the Philippines. 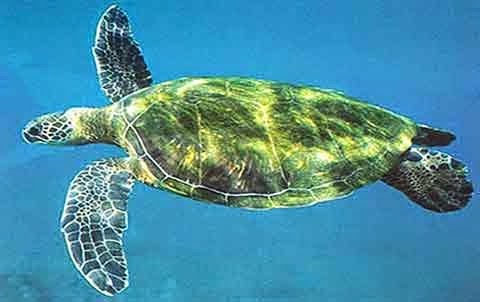 The most common species present in the coastal waters of Sorsogon are the Green and the Hawksbill. According to the World Wildlife Fund, collecting pawikan eggs has been a traditional source of livelihood because people think it has some medicinal value without realizing that these resources are exhaustible. Since 1951, there has been an 88-percent decline in egg production and this would mean the hastening of extinction of the species, it said.